Ultra-violet printing is not a new technology. As a matter of fact, it has been utilized with great success for more than a decade in the flexographic printing industry. UV print technology offers a higher quality print as compared to water-based or solvent ink systems. UVA, UVB, UVC and UVV wavelength outputs through medium pressure mercury vapor lamps for UV printers to operate. Following the transfer of the ink to the substrate, UV light is shone to expose the photo initiators in the ink system which then turn into “free-radicals;” this means they will seek out the monomers and oligomers, adhere to them and perform the printing task. UV print technology provides a print quality that is prized for its ink density and the high quality of its graphics printing. When it comes to quality and clarity in the printing industry, accuracy is of utmost importance. At Universe Optics, we specialize in UV precision lenses that are used within the printing industry. You can depend on our team of engineers and manufacturing department to deliver the highest quality lens for your specific UV printing needs. Additionally, LED curing technology for UV printers is replacing older technology with compelling advantages of better economics, system capabilities, and environmental benefits. UV LED curing technology is rapidly becoming the new standard for UV printing for both full cure and pinning applications. Most ink manufacturers include a UV LED option today, making integration and use of LED even easier. The narrow UVA output provides the highest curing efficiency while also providing a cooler, safer, and more stable output, allowing end users to print on a wider variety of materials with increased yield and reduced operating costs. UV LED pinning technology used between inkjet heads provides just the right amount of UV energy to control dot gain and achieve a variety of printing effects at increased speeds. UV LED can also be used for full cure of digital inks in bi-directional, single pass, and 3D printers to create products such as posters, labels, signage, packaging, and 3D objects. 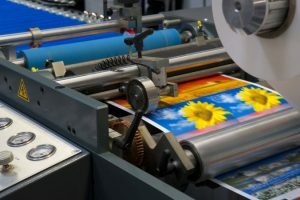 Flexographic printing is a process of using a flexible plate to transfer the image to the media; typically used to create labels and packaging material. UV LED curing technology for flexographic printing provides faster output with higher yield through tighter process control. The low heat output allows the use of thinner and more heat-sensitive materials while also eliminating the need for chill rollers. The combination of low heat and high energy makes UV LED a good fit for screen printing, which allows a wider variety of materials to be used including plastics, metals, ceramics, glass, wood, posters and other items. UV LED for screen printing is most commonly used for direct bottle and tube decoration, which eliminates the need for a label. Old-school UV printers may have been exceedingly large and expensive, but technological developments have made cutting-edge UV printers economical in both size and price. UV print technology is the wave of the future for the fast-paced printing industry.